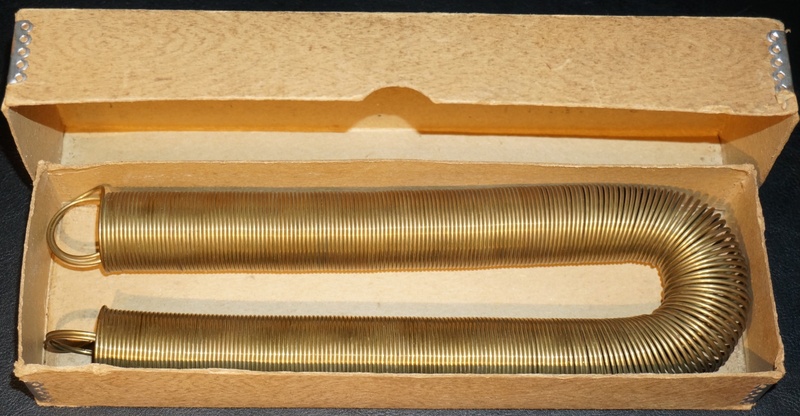 I came across something strange, a long brass spring at the 2017 Hamvention that jogged a memory of a similar very flexible brass spring that was in my Dad’s junk in our basement when I was about 15 years old. My father said it was an old screen door closer spring. Wooden screen door closer springs are usually about 3/8 to ½ inches in diameter and made of steel. As it turns out, this thing was an old radio antenna of some kind. This spring is 1 & 1/8th inches in diameter and 16 & ¾ inches in length. The diameter of the brass wire is equivalent to a 14 gauge wire. There are 17 turns per inch. The overall length of the wire including the loop ends is = 1,006 + 2 inches or 84 feet. Now, when an antenna is coiled, its efficiency results in a negative DB gain – depending on how compressed the coil is or rather how far apart the spacing between each turn is. That would be an interesting experiment to see how far the antenna would have to be stretched until it had a zero DB gain. Its end-fed quarter-wave resonate frequency is 2.7812 MHz which is between the 160 and 80 meter ham bands. I seriously doubt this was used for ham radio. It was more likely an early 1920s broadcast receiving antenna. Other than the label, there are no markings on the box or on the antenna. So, I have no idea what date it was manufactured. I googled “Keystone Brass Aerial” as well as a bunch of different variations, but – nothing. There are 10 turns per 1.5cm or 15mm. The antenna coiled up is 43cm or 430mm long. Wire Length = 430 / 15 · 10 · 94.24778 = 27017.6969mm or 2701.76cm or 27.01m approximately.